The lamb with nectarines at Alba in Malvern. Summer fruits have officially arrived, which means it's the season of sticky elbows, stained T-shirts, and the sinking unease that someone has already fondled all the nectarines at the supermarket. It's also the season of micromanagement in the kitchen, lest you miss the 20 minutes before that perfect peach becomes a bruised mush ball. Which is why it's important to have some great fruit recipes in your arsenal, with more ways to incorporate these fleeting beauties into the menu right this very moment—you don't even need to wait for dessert. "Bringing fruit into savory dishes is common in Italy, and we like to do it here as the berries and stone fruits come into season," says Sean Weinberg of Restaurant Alba in Malvern. A natural application is salad. At the recently opened TALK in Rittenhouse Square, chef Tim Lanza adds strawberries to his panzanella, where they burst sweetly in between tomatoes, crunchy cubes of toasted bread, and a smear of creamy burrata cheese. The restaurant serves it over a basil jam, but even the simplified version included here is pretty spectacular. Melon and prosciutto are a classic duo, but caprese salads also welcome either fresh or grilled watermelon or cantaloupe. Diced plum or blueberries spruce up a chopped salad. Or try bruschetta, swapping out the tomatoes for figs, cherries, apricots, or plums, and layering them with a soft or creamy cheese. The salmon poke bowl with peaches at Cheu Fishtown. Cheu Fishtown's Ben Puchowitz scatters peaches in a seasonal grain bowl/poke dish, where it mingles with cubed avocado, thin rounds of cucumber, and sushi-grade salmon, all tossed with a rich miso-mustard vinaigrette and served over a mix of quinoa, sushi rice, and kasha. "We'll also do a melon salad as a special — honeydew with charred shishito peppers and togarashi dressing, served with baby kale and crispy rice cracker. Or we might serve watermelon with yuzu and fermented black beans, which is almost olive-y, along with some whipped feta, so it becomes an Asian spin on the watermelon feta salad," Puchowitz says. Of course, this being summertime, fruit can easily be incorporated into grilled dishes, or grilled right alongside proteins. "Grilling is the first thing I think of when I think of summer fruit — grilled peaches or apricots are always good with pork or raw vegetables, to add a bit of sweet or tart flavor," Puchowitz says. But it's not all about salsas for grilled fish or delicate glazes for chicken breast, either. Summer fruit can stand up to heavier, more flavorful meats. 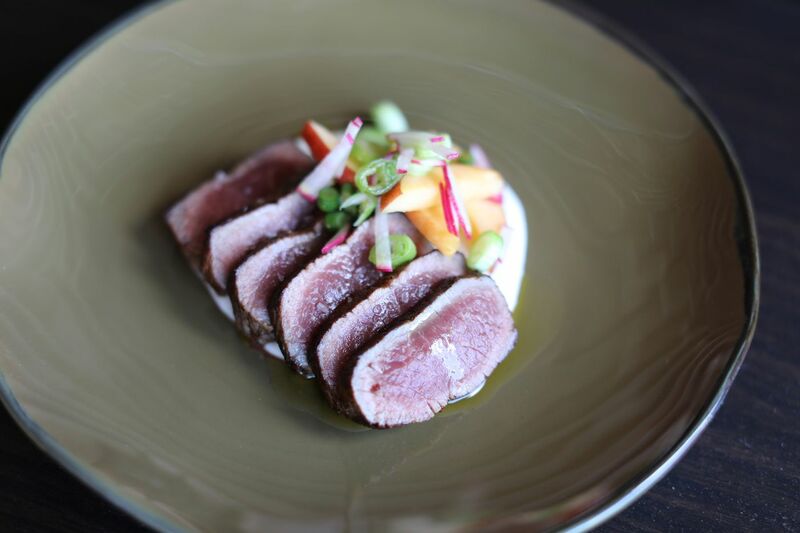 At Alba, Sean Weinberg takes a cue from Italian tradition and tops a coffee-rubbed lamb loin with a nectarine and radish salad, a light and crisp counterpoint to the unctuous meat. A similar dish, from Hugh Acheson's The Broad Fork (Clarkson Potter, 2015), marries veal loin with sautéed arugula and brown-butter peaches. "I like to use fruit with earthier, more gamy meats or even mushrooms. In Italy, you see mushrooms with peaches or blueberries, and that contrast works really well," Weinberg says. Tomato and strawberry panzanella at TALK. An already popular dish on the TALK menu is spaghetti with Parmesan, morels, fresh figs, and prosciutto which manages to get all the flavors (salt, sweet, umami) in one bite. Pastas, too, can be a good place to experiment with sweet and savory. An easy throw-together dish is pasta with berries, ricotta cheese, and fresh herbs like mint and basil. Just throw it together gently. Remember, there's a small window of ideal texture and sweetness here. "When summer fruit is good, you don't have to do much to it, but it needs to be monitored," Puchowitz says. "At home, you have more flexibility than you do at a restaurant but you still have to watch because stone fruits can be too soft or grainy when they're overripe." When fruit edges toward soft oblivion, it can be stored in the refrigerator to slow down ripening. If you have the opposite problem — fruit that probably shouldn't have been picked — set it in a brown paper bag in the warmest area of the kitchen to speed up the ripening process. "Always try to get it at the peak of ripeness," Weinberg advises. "It doesn't have to be juicy and exploding, but it should be firm and ready to stand up to whatever else you're doing with it. And if it's gone too far, you can always use it in a cocktail."